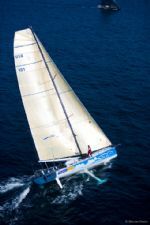 Pegasus 101 (Philippe Kahn): "This is the best sailing that I have ever done. It's like crossing an ocean on a 505 [skiff]. The boat is that nimble and that "on the edge," and with the two of us it's exactly the same dynamics as a 505 or a 470 crew. The sails are a bit bigger. What is remarkable is that we are pacing a fleet of fully crewed racers. " "For the final hours of the race we saw up to 36 knots of wind and sustained 20 knots of boat-speed easily. The speed potential of these boats is huge as they plane so easily. In displacement mode, a boat's speed is limited by its 'hull-speed'. A rule of thumb is that that hull speed can be approximated by calculating the value of 1.34 * sqrt (length), which, is about 9.5 knots in our case. The Pegasus Open 50 is a planing hull. That means that the hull is configured to develop positive dynamic pressure so that its draft decreases with increasing speed. In other words, the faster you go, the less draft there is and the faster you go. We jibed at the tip of Molokai in one of theose extraordinary moments, where the whole universe seems to be in focus. And we pulled it off. What a team! We finished at 10:25 hst, in 10 days 29 hours and 25 minutes. We missed the record by a few hours. It was awesome, the boat was awesome, the whole team was awsome, and Richard fantastic. Things don't get much better than this."